The world is changing. No longer do we have to physically meet someone to call them your friend. Now, in this digital age, a friend can be a faceless voice on the end of a games console or a person who makes comments on your social media site. Yet are these your real friends? And how much do we really know about those people who just happen to “like” something on Facebook or Instagram? Ingrid Goes West is a very black comedy that happens to be a cautionary tale of those people out there who may take a reply to a comment as being a sign they want to be your BBF. Ingrid is a very troubled young woman. Her mother has died and left her a pile of money. She has spent time in an institute after disrupting a wedding where she attacked the bride for not inviting her. She feels alone and her only companion is her mobile phone. While flicking through a magazine, she comes across an article about Taylor Sloane, an up and coming Instagram star who posts her wonderful life on the site. When Taylor replies to a comment that Ingrid has made, this triggers Ingrid to head to LA to try and befriend this new obsession. Once she has found her way into Taylor’s life, Ingrid becomes so possessive, she will do anything to keep that friendship. Matt Spicer’s film is unbelievably uncomfortable viewing. Reminiscent of the old 90’s stalker films like Single White Female and The Hand That Rocks The Cradle, the film is a mixed examination of how people can think that because they are liked on social media, they have a pass to invade their lives. We watch Ingrid, who is obviously suffering from a huge degree of obsessive behaviour, move to LA, shop where Taylor shops, changes her look and manages to find a way into Taylor near-perfect life by committing a crime and becoming the heroine. From that moment, they become friends, just as Ingrid wants. It is to Matt Spicer’s terrific direction and script (which he wrote with David Branson Smith) that you find yourself feeling increasingly anxious for what is about to happen. Spicer has created a world where the people who live in it are self-absorbed yet he manages to make you care for what happens to them, especially Ingrid. Aubrey Plaza, who also co-produced the film, is superb as the troubled lead. Here is a woman who on the one hand you feel complete sympathy for, who is living a lonely existence and who has been through tough times, yet on the other hand, she’s living in a world where her phone and social media is commanding her life. She doesn’t know how to make real friends, just make-believe ones. It’s her best role since Parks and Recreations. Elizabeth Olsen is equally good as Taylor, the new friend in Ingrid’s life, who seems to have little concern for treating people like dirt and while she seems all sweetness and light, she has a very dark inner soul. Kudos also go to O’Shea Jackson Jr as Dan, the man with an unhealthy obsession with Batman, who is drawn into Ingrid charade. Not laugh-out-loud funny but still darkly comic, and surprisingly creepy, I haven’t sat through a film feeling tight in the chest, wondering how far Ingrid will take her lies to win a superficial friend. Sometimes cinema doesn’t necessarily need to be obvious in how it deals out the emotions. 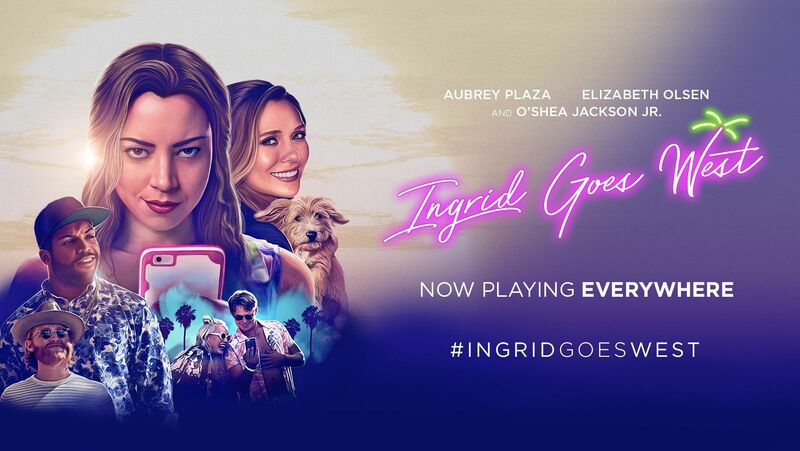 Ingrid Goes West works, not only as a piece of entertainment but how an innocent comment can lead to something far more sinister.